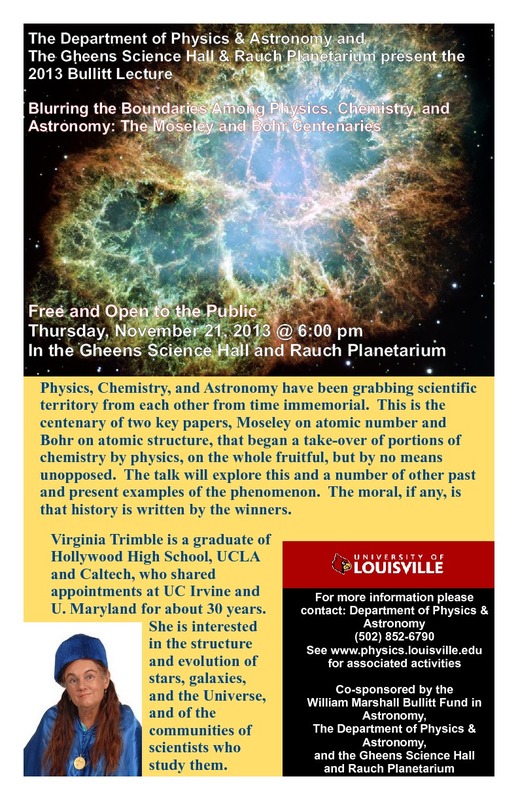 5:30-6pm and after the lecture: U. Louisville physics & astronomy majors and graduate students Austin Gornet, Brian Leist, Geoff Lentner, Blake Pantoja, Conrad Smart, Jason Thieman, Amna Zolj and others will be available to talk one-on-one with interested middle and high school students about studying astronomy in college, and about careers. Parking: Visitor parking is available in the lot immediately to the east of the planetarium building, north of Davidson Hall and south (across the street) from the School of Music. At 5pm, the red (reserved) lot which is just north of the College of Business building, and west of the School of Music will be opened to the public. Virginia Trimble earned her undergraduate degree from UCLA, and received her PhD from Caltech in 1968. She is famous for an annual review of much of the scientific literature in astrophysics, and has served as vice president of both the American Astronomical Society (AAS) and the International Astronomical Union. She was awarded the AAS Van Biesbroeck Prize in 2010 for a lifetime of service to the profession. Dr. Trimble has published 200 scholarly articles and an even greater number of conference presentations and popular works, working in such diverse fields as supernova remnants, pulsars, dark matter and also publication trends and the sociology of astronomers. She is very active in public outreach and gives many popular talks on astronomy. We will record the lecture for our talk archive. Here is the link on YouTube.